LIGHT & COMPACT DUROMETER WITH BUILT-IN PROBE! HT-6510A model is a pocket size digital durometer with integrated or built-in probe. 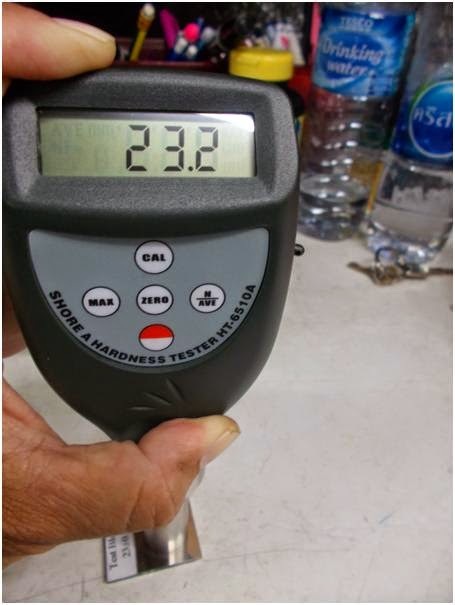 The resistance toward the indentation of materials that range from rubber, elastomers and other rubber like substances are measured quickly and effectively with this precision perfect instrument. It measures the depth of an indentation in the material created by a given force on a standardized presser foot and is capable of producing a value from 0 to 100, with higher values indicating a harder material. A durometer testing equipment type A is fully equipped with an indenting foot of hardened steel rod 1.1 mm - 1.4 mm diameter with a truncated 35° cone, 0.79 mm dimeter. It includes an exclusive built-in Microcomputer LSI circuit advanced microprocessor technology and crystal time base that quickly provide measurement readings with the highest level of accuracy and with no guessing errors in less than a second. The results obtained from this test are a useful measure of relative resistance to indentation of various grades of polymers, elastomers and rubbers. It can measure the penetration hardness of soft rubber, elastomers and other rubber like substances such as neoprene, silicon, vinyl, nitrile, butyl, soft plastics, felt, leather, waxes, printing rollers and similar materials. In addition, we constantly keep in mind that the safety of the user should always comes first and so we made sure that our products comply with all the necessary health and safety required standards set by the European Directives. Certified to meet the following rigorous standards of ISO-7619 and ISO-868, DIN53505, ASTM D2240, and JIS K7215 set standards. It is recommended that measurements be made with the type D durometer when the value is above 90 HA, and with a type A durometer when the value is less than 10 HD.